If you know me I am down with the free pocket change. It adds up. There are entire websites dedicated to how to earn pennies (LITERALLY The Penny Hoarder) but seriously who has time to go through and try all of their suggestions (Justen Martian often tries stuff he reads on there LOL)? I’ve spent time looking at a lot of “earn money by doing this” apps/sites/etc, and I’ve compiled my five favorite ones that require very little effort and whose rewards I’ve benefitted from. I first started noticing Ebates on Mattie’s budget recaps. She had money she was earning for shopping online and I was kind of mind-blown. Swagbucks offers Swagbucks for shopping, but this was like real money with no real threshold and I was intrigued. I really started using it last fall and since then, I’ve made $170.40 just by installing the Ebates button on Safari and clicking it before I check out on any site. I LOVE that you earn 7% back when you shop on iTunes – before I buy anything on iTunes, I go to the Ebates app, click through and then enjoy getting some change back just for buying music I was going to buy anyway! Last week I was at the store and took the twins on a scavenger hunt to find things and scan them. They had fun and I earned points to redeem for a gift card. So far I’ve earned $65 in free gift cards simply by opening the app when I’m wandering around the mall (you get kicks just for walking in to certain stores!) and scanning things. Often when we’re at Target and I’m looking at stuff, Justen will take my phone and go get some kicks for me. Okay Seashells is pretty brilliant. You buy gift cards online and you receive cash back for them. Want to know the best part? Some of them stack! For example, when I need to buy new ink for my printer, I buy a $40 Staples gift card. Then I go to staples.com and activate Ebates. I choose to pick them up in the store, saving on shipping, and then I’ve received cash back for the gift card AND cash back for Ebates. They have Amazon, iTunes (stacking potential there! ), Chipotle (omg praise hands), Red Robin, Regal Cinemas, Home Depot, Walmart and Uber… to name a few. If you join using my code (mw1llubX), you’ll get $5! Last Justen checked, ReceiptPal isn’t accepting new members. He uses something similar, ReceiptHog. I love ReceiptPal because all I have to do is scan receipts and I earn points to be redeemed for Gift Cards. I recently connected my e-mail address so I automatically get points for any receipts that come to my e-mail inbox – including my Poshmark sales! That is AMAZING, because I’m earning money for gift cards just by making money! I love it so much. There are tons and tons of ways to earn some pocket change online (that’s what I love to call these apps/sites because do you KNOW the power of saving your change for a year and then cashing it out for $110 unexpected dollars? it’s so exciting! ), but these are my 5 favorite that have consistently paid out. Have you signed up for any of these or am I missing some other great way you’re collecting pocket change?! Let me know in the comments! Welcome to the second installment of The Poshmark Series, where I’m walking y’all through how to make some moolah on Poshmark. You can read the intro post here, or you can keep scrolling to find out why I recommend Poshmark over other reselling options. Check out my closet here, and sign up for Poshmark here with my code BWCTE for $5 credit towards your first purchase! ThredUp is an online consignment store. They send you a big bag, you shove it full of high-quality name brand items and send it in. Prior to them sorting the bag you can pay a fee to have anything they won’t accept returned to you, or you could forgo that expense and they’ll discard the unaccepted clothing. They take the shipping charge off of what your bag is worth and then they give you a ThredUp balance of that amount. After two weeks or so you can redeem it for a visa gift card sent via the mail. The waiting period is probably in hopes that you’ll choose instead to spend it on their site. ThredUp is better than Poshmark if you have piles of clothing you’re on the verge of donating and making $0. If you have a bunch of clothes you want out of your house ASAP, then ThredUp is the best option for you. You can join with my link and receive off your first purchase. Poshmark is better than ThredUp if you are wanting to have control of the money you make and you have the time/space to dedicate to clothes you’re waiting to sell. Your items may not sell immediately, but you get to choose the price and you get to control how low you’re willing to sell them. 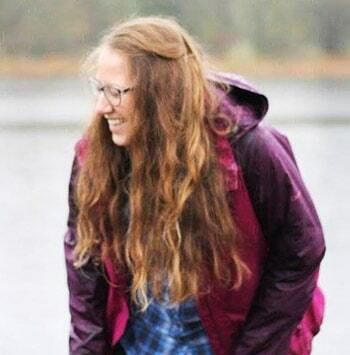 Here’s why I choose Poshmark over ThredUp: I once found a pair of Athleta leggings at the bins. I only paid 75 cents or so for them. They weren’t in my size, but I thought they were a pretty good find. This was pre-Poshmark for me, so I sent them to ThredUp expecting to make some good money off of it. They gave me $4ish dollars for the leggings, and within 24 hours they had sold them for $54. No. Thank. You. I have been selling my old Victoria’s Secret PINK sweatpants on eBay since… well, forever. Most of my sweats came from various thrift stores, so I tend to acquire overflowing drawers full, then I’ll sell a bunch and then re-fill the drawers. Most people know how eBay works, but here’s an overview just in case. You can list your item to sell or auction and it’s seen by a lot of people. Buyers can bid and outbid and they have a bit of a choice over how much they’re willing to pay. You, of course, can set the starting bid or buy it now price. Where ThredUp is the middleman between buyers and sellers, eBay is less so. You are in charge of determining shipping costs and deciding which shipping method to use and invoicing the buyer, unless you have a set shipping fee. eBay is better than Poshmark if you want to sell a variety of items. Poshmark is strictly clothing, shoes, accessories & NWT makeup items. If you have lotions, trinkets, etc. eBay is your way to go. It also is more widely known, so your potential audience is much greater. Poshmark is better than eBay if you don’t want to deal with the hassle of shipping. I’ll talk about this more in a later post, but they charge a flat shipping rate of $6.95 for 2-3 day delivery up to 5 lbs. The buyer automatically pays the shipping cost and your only hassle is making sure you have the correct packaging. Here’s why I choose Poshmark over eBay: There was a pair of NWT Old Navy jeans that had been sitting in my Poshmark closet, unsold. I’d picked them up at the Bins and I decided I just wanted them gone. Shipping is confusing, and even though I’d weighed the jeans beforehand when I went to buy the postage, I ended up paying almost exactly what the buyer had sent me to cover the whole transaction – meaning I sent away a brand new pair of jeans and made less than a dollar on them. I’m sure there’s a learning curve, but I’m not down to lose a bunch of money while I figure it out. Vinted is similar to Poshmark, but online. They have forums and encourage a lot of user engagement. There’s just not a huge buyer audience there. There’s a reason you won’t find a J. Crew store in a little Main Street shop in the middle of nowhere. If you’re selling a product you want people to buy, you should probably sell it where the buyers are. This is why so many big name stores have been closing lately. The buyers are not walking through their doors, the buyers are shopping online. As for the other reselling sites and apps, I just don’t have time to manage that. Cross posting, making sure the inventories are accurate.. I just have not the time. Instead of spreading my energy thin by learning a zillion different selling tools, I’ve chosen to focus on ONE: Poshmark. If you want to learn more, here is a post about selling on Mercari and here is one about selling on Vinted. So now that I’ve shared with you why I choose to use Poshmark over other platforms, join me next Friday for the next installment in The Poshmark Series, which is going to be all about getting started – the lingo and the basics! As always, hit me up with any questions you may have because the last post in the series is going to be full of YOUR questions! When I find something that’s almost-too-good-to-be-true but still tried-and-true, I have to share it. As y’all know, I’m trying to tackle my debt. One way I do that is by earning gift cards for things I’d be spending money on, thus creating more wiggle room in my debt crushing. Like… if I can put $5 on my Starbucks card but someone else could put $5 on my Starbucks card and I could put $5 towards my debt… that’s a win-win, for sure. Here are five apps that I’ve discovered that help you earn gift cards. If you’re reading my blog, I’m guessing you’ve heard of ibotta just because I think most people have heard of it. But in case you haven’t… ibotta offers you cash rebates for purchases. They always have opportunities for bonuses, and if you are diligent in checking to see their offers, you can make a lot of money. I’ve made $36 so far, and never once have I purchased something I wasn’t already going to the store to buy. If you sign up with my referral code, you’ll get $10 (and I’ll get $5 for referring you). The great news is that you can stack these with coupons and discount apps like Cartwheel! Major savings potential. I use Receipt Pal. Justen uses Receipt Hog. Both have the same purpose – you take pictures of your receipts, for points that you can cash out for gift cards. Receipt Hog is way more fun and interactive, but they haven’t accepted me yet. Receipt Pal has a limited amount of receipts you can scan per week, but if you’re diligent the points add up quickly. I’ve already redeemed a $5 gift card for Regal and am currently trying to figure out where I should redeem my $25 gift card. In terms of ease, convenience and “no purchase necessary,” shop kick is the the way to go. You get kicks (points) just for walking in to certain stores, and you can earn more kicks when you scan certain items at the store. Even better? They offer “kick bates,” which means that if you buy certain items and submit the receipt, you’ll receive bonus kicks. Not only that, but you can link your debit card and earn kicks for qualifying purchases at a bunch of stores. You can stack all of the apps so far. A few weeks ago, I walked into Walmart and got 35 kicks just for showing up. I scanned Coffeemate creamer for 15 kicks. I checked ibotta and saw that they had a rebate for Coffeemate creamer purchased at Walmart. There was a kickbate. So I earned $.50 in ibotta, 150 kicks from the kickbate PLUS 2 points/$1, and then I scanned the receipt. All for something I needed to purchase anyway. Shop kick is by far my favorite gift card earning app, because I think it’s the easiest and requires NO money or purchase whatsoever. If you have my phone number I’d love to text you a link to join shop kick (I’ll earn a portion of the points you do for the first 2 weeks you have the app installed). If not, sign up here. This app is so stupid easy to use. They give you scratch cards. You scratch off 3 of the 6 squares and hope they match. If they do, you get a deal or a gift card. I’ve won a $5 Amazon gift card. and I’ve done nothing but play a stupid easy game. You earn coins as you play, and those can be redeemed for gift cards when you get enough. I’ve never had enough so I cannot vouch for the validity of that. If you’re already playing games, you might as well play a stupid easy one that might win you a gift card. It started with Sworkit. I downloaded the Sworkit app and realized I got points for finishing the app workouts. Then I realized you could also get points for mPlus places. THEN I realized there’s actually a plethora of mPlus points apps that all earn points in your mPlus account. My favorite is mPlus places. It’s like Swarm but with real points that get you real gift cards. There are a bunch of games that earn you mPlus points as well, so if you’re a person who likes to play games on your phone.. hello, you should earn real points that earn you real gift cards amiright?! 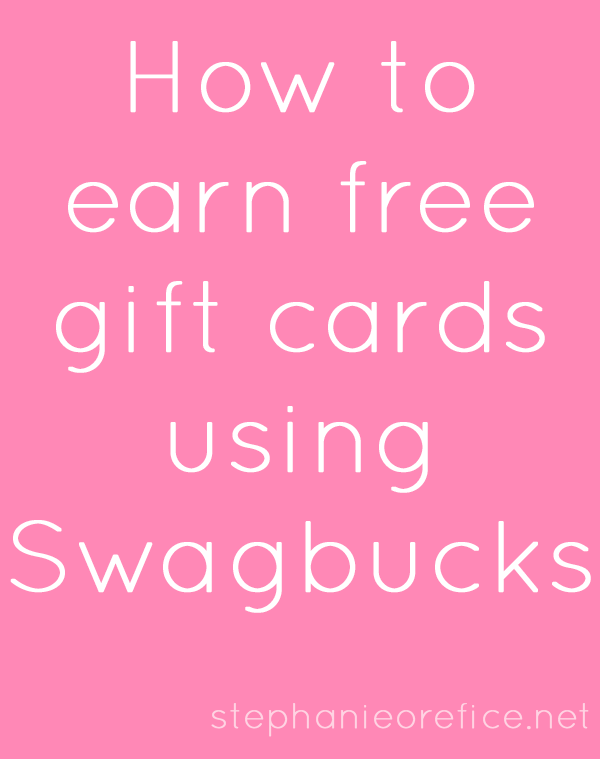 Using Swagbucks to earn gift cards. Last week I wrote about my May goals, and one of them was to figure out how to spend my $120 in Swagbucks gift cards. In my time of using Swagbucks (probably 5 years) I’ve accumulated nearly enough points for $400 in gift cards. What! That’s crazy! I am CONSTANTLY telling my friends to use Swagbucks. If you get in the habit of using the site, you’ll start earning gift cards while you’re watching TV or doing things you normally do like searching the web or making purchases online. I’m going to walk you through the ways I usually and consistently earn Swagbucks. Throughout this post I’ll refer to SB (Swagbucks) which is the point currency system on Swagbucks.com. 500 points = $5 gift card. On the home screen of Swagbucks is a daily to-do list. A poll for 1 SB, No Obligation Special Offers for 2 SB (you click through and say “skip” on each offer), daily use of installed Swagbutton (in your browser) for 1 SB and the Daily Crave for 1 SB.These tasks can be completed within the time it takes for a commercial break of your favorite TV show. 5 SB a day. 30 days a month = 150 SB/month or 1,800 SB/year, which is $15 in gift cards. Some of you might think “that’s a lot of work for not a lot of payoff.” Do me a favor. Develop this habit. Every time you want to type in a website, first go to swagbucks.com and then type in the name of the website. I do this with EVERYTHING – Google Analytics, Google Adsense, Google Maps… okay, not Facebook or Twitter, but basically any website I don’t know off the top of my head, I type into Swagbucks. Every so often you get a Swagbucks search bonus. They tend to be between 7-9 SB, but I once received 40 SB for searching. Before you buy ANYTHING online, go to the “shop” option of Swagbucks and search for the store you were going to buy from. I never buy directly from Groupon, I always go to Swagbucks and buy through there. There are SB per dollar offers, sometimes up to 8 per dollar, and you can earn large amounts of SB just by making purchases you were planning on making anyway. Swagbucks has a variety of videos you can watch – I love the pop culture/entertainment ones – Every 10 videos, you earn 3 SB and you can earn up to 150 a day. If you’re just on the computer and don’t mind background noise, this is a perfect opportunity to earn lots of Swagbucks while you’re going on your everyday life. They even have a mobile app for watching the videos. Like with most survey sites, this is hit or miss. Swagbucks offers surveys, but you have to qualify. The payout for surveys you are able to complete is pretty good, and you get 1 SB for being disqualified. Last month I finished a survey and earned 60 SB. Definitely worth the disqualification, and I’m sure I could be earning more through surveys, but it’s not really my cup of tea. Swagbucks hosts TONS of special offers that hook you up with SB. When I caved and signed up for the Disney Movie Club (which I sadly had to recently cancel because of my new debt repayment journey), I did so through Swagbucks and earned a few hundred points. Same goes for when I signed up for Julep… and Graze. Some of the offers cost money, but others are “Watch a short video” or sign up for an e-mail list or download an app. When you sign up for Swagbucks using the link I’ve provided, you become my referral. I will earn 10% of what you earn. They don’t take the points away from you, they just kick them back to me. Do you see how brilliant this is? The more people you refer and teach how to use Swagbucks, the more SB magically appear in your account. Once you start redeeming your SB for gift cards, this will become a no brainer. These are my favorite ways to earn Swagbucks. You might find that some work better than others, but if you get into the habit of making Swagbucks.com a daily part of your life, you’ll be amazed at how the SB add up and you’ll be in the dilemma I’m in now – what to spend my 12,070 Swagbucks on! I’m torn between Paypal money to put towards my debt (#grownup!) or a Starbucks gift card (to save money on coffee and put more money toward my debt… #grownup!) or an Amazon gift card to splurge on more Instax film (and save money… to put towards my debt… #grownup!). What do you think? ?